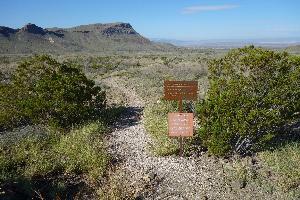 This is where the trail starts/ends along Ross Maxwell Scenic Drive. Comments: I hiked the Chimneys Trail from Ross Maxwell Scenic Drive to the end of the trail near Old Maverick Road. The trail is flat and easy to follow. Trail signs are placed at both ends and rock cairns mark the path along the way.